The Walpole bio-landscape is found surrounding the Walpole township, in the Shire of Manjimup and on the eastern edge of the Warren catchment. Most of the bio-landscape is located within the Walpole-Nornalup National Park, the Mount Frankland South National Park and the Walpole-Nornalup Inlets Marine Park. 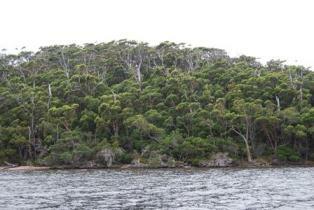 The Deep River, Walpole River, and Frankland Rivers flow into the Nornalup Inlet within this bio-landscape. There is one threatened ecological community found within the bio-landscape, in a number of locations which is the Reedia Swamps – Warren Region TEC. The full title of this Priority 1 TEC is “Reedia spathacea – Empodisma gracillimum – Schoenus multiglumis dominated peat paluslopes and sandy mud floodplains of the Warren Biogeographical Region”. There are 11 DRF and 16 priority flora populations identified including species such as Chamelaucium sp. Nornalup, Leucopogon alternifolius, Diuris drummondii, Boronia virgata, Actinotus sp. Walpole, Chamaexeros longicaulis and Calymperastrum latifolium. 24 endangered and 4 priority fauna populations have also been identified including species such as the Walpole burrowing crayfish, Western Mud Minnow, Walpole frog, brush-tailed phascogale, baudin’s cockatoo, forest red-tail black cockatoo, Carnaby’s cockatoo, tingle trapdoor spider, Wambenger or brush-tailed Phascogale, quokka and the hooded plover. A number of migratory birds, protected under International Agreements, have been identified in the area including the Common sandpiper, Eastern Great Egret and White-bellied Sea-Eagle. Where Very High = greater than 25% reduction; High = 20-25% reduction; Moderate = 15-20% (Note: no where in the region is there projected to be less than 15% reduction in rainfall). Where Very High = greater than 4 degree increase (maximum projected being 4.7 degrees within the Region); High = 3-4 degree increase; Moderate = 2.5 – 3 degree increase; Low = 2 – 2.5 degree increase (Note: no where in the region is there projected to be less than a 2 degree increase which although lower than the very high 4 degree increase, will still have significant impacts on the environment). This analysis is a simplistic way of looking at the potential risk of an asset to projected changes in rainfall and temperature. Assets may respond to climatic changes differently and species may be able to adapt in ways we don’t yet fully understand. The Walpole bio-landscape is identified as a second order priority asset within SWCC’s NRM Strategy under the Terrestrial Biodiversity theme. 2009 Biodiversity Sub-Strategy for the South West Catchments Council Prepared for the South West Catchments Council by Ecosystem Solutions Pty Ltd 2009. Header and thumbnail images supplied by Damien Postma.